Luhrman is a one-shot character who appeared only in "I Don't." His name is often misspelled in fandom (Lurman(n), Luhrmann, Lehrman(n), etc.). 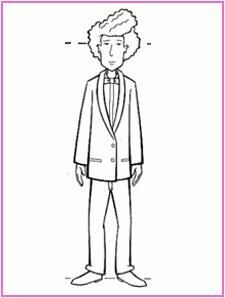 Almost nothing is known about him, including what relationship he could have possibly had to either half of the hapless, stupid couple getting married. 1 Luhrman in "I Don't"
Luhrman was a member of the wedding party at cousin Erin's wedding, possibly on the groom's side or Erin's (absent) father's side. 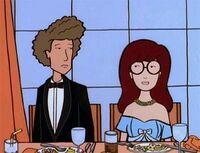 He was paired with Daria, and the pairing proved marginally apt, because Luhrman displayed a level of cynical sarcasm that approached Daria's. Daria - So, Luhrman. Is that your first name or your last name? Luhrman - Does it matter? (Said to Erin's husband after a display of caveman-like sexism.) "I'm sorry, what did you say you do? I thought I heard intelligence, but that can't be right." Daria - Mmm-hmm. What did you say? Luhrman - Just a little pointless chit chat. Forget it. Would you like another soda? Luhrman - Or shall we just split a bottle of drain cleaner? (Daria stares at him) Please be assured that my remark was intended in jest, and not as an incitement to any type of self-destructive behavior. Daria - You're not from around here, are you? Or the fact that he turned down an opportunity to escape the wedding with Daria and Amy, choosing instead to stay and "watch the carnage," as multiple drunken brawls began to erupt. Luhrman, to Daria's surprise, helped back up her lies to the other bridesmaids. After turning down the offer of escape, he did tell Daria "it's been fun", apparently genuinely; she made similar remarks. The character's matching temperments and interaction has fueled speculation that he and Daria might be a valid couple. 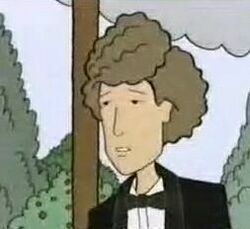 Glenn Eichler, when an interview turned to characters being shipped with Daria, stated he liked Luhrman as a potential match. In the MTV flipbook "It Takes Two to Tangle", it was written of the pairing: "Compatible energy levels (minimal), but they both suffer from over-reliance on ironic detachment. Viva La Indifference!" Luhrman appears now and then in fanfiction, usually as a guest character and quite similar to canon. He is sometimes paired with Daria but not that often. This page was last edited on 8 April 2018, at 09:54.